Nowadays, tablets are widely used for gaming. To increase the gaming functionality, now the tablets are released with dedicated keys. Like Sony PlayStation Portable(PSP), tablets are manufactured by different vendors for Android and Windows 8 OS. Gaming tablets need high graphics card configuration. Gaming tablets with sturdy graphics card that we use in our normal PC's does not interest any longer. Traditional PC games are now out of fashion. Gamers prefer to play games in portable devices. Below I have given some successful gaming tablets. JXD announced its Android Gaming Tablet priced at $150 on January 2013. It is a 5 point multitouch capacitive touch screen tablet with screen resolution 1024 * 600. Hardware specs of this tablet includes 1.5GHz clocked dual-core processor with ARM Mail 400 processor, 1GB of RAM, 8GB memory and microSD card slot, high definition HDMI interface and equipped with a front VGA camera running on Android 4.1 Jelly Bean operating system. To play games, you can use the buttons available JXD S7300 Tablet. Dual core processor is capable to support high quality games. With this tablet, you can get many pre-installed games. This tablet is available for sale from February 2013. This tablet was first launched at Europe and its success made this tablet's journey to America. Buttons are present on the extended sides of the tablet. This looks similar to a PSP(PlayStation Portable). Hardware specifications of this tablet includes 1.6GHz dual core CPU, Quad core graphics card specially installed for gaming experience, 1GB RAM and 7 inch 5 point multi touch display. This tablet runs on the latest Android Jelly Bean OS. Archos Gamepad has a mini-HDMI port, using which you can plug it into your TV. Price of Archos Gamepad is $170. I read many reviews about this tablet and I came to a conclusion that "This tablet is a blessing for Android game lovers". I hope this tablet will soon arrive in India. WikiPad gaming tablet had 10.1 inch display and now it is redesigned to 7 inch. WikiPad's 10.1 inch version was discontinued as it seemed to be inconvenient. The new version of this tablet has the same features. As they have altered the screen size, the resolution and some display features alone varies. 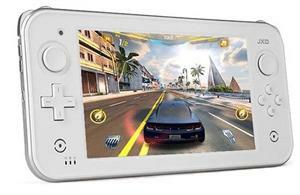 Wikipad gaming tablet key specifications are Tegra 3 Processor, 16GB of built-in storage, 32GB expandable and a front-facing camera. This tablet comes with Android 4.1 “Jelly Bean”. This tablet was priced at $249 (12,500 Indian rupee) and it's predecessor (10.1 inch version) was priced at $499 (25,000 Indian rupee). Since most of the Android Games are designed to run on 7 inch tablets, Wikipad has stopped 10.1 inch version and redesigned it to 7 inch. Pearl is an old Android Gaming Tablet still available in market for sale. It runs on Android 2.3 OS. All the features are similar to Micromax Funbook. You can enjoy playing games by using the Joypad available on either side of the tablet. Playing games using Joypad will be more convenient than using touchscreen. This tablet received positive reviews from all users. Advantages of this tablet are sharp screen, a convenient design for gaming, and good battery backup. Disadvantages of this tablet are older Android version, lack of tablet optimized games and frame rate issue with some games. If you are looking for best gaming experience, Pearl delivers better than other gaming tablets before it. 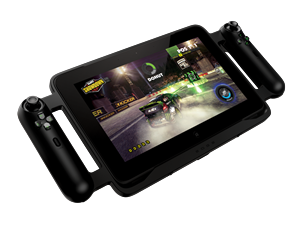 Razer Gaming Tab is another high performance tablet which bagged "Best of CES award 2013". It has got impressive hardware and software to run high compatibility games. This tablet is available for sale from February 2013. It is the first tablet running on Windows 8 with Intel Core i7 Dual core processor. This tablet is mounted with NVIDIA GeForce GPU which enhances the graphics acceleration. This tablet has a 10.1 inch IPS display with resolution 1366x768. Special hardware for video processing, Intel HD4000 is available in Razer Gaming Tab. This device will be available in two storage versions 128GB SSD and 256GB SSD. Other features include Stereo speakers, front-facing 2MP HD web cam, Array microphones and USB 3.0 port. Price of Razer Edge Pro is US $1,299.99. Thanks for this good and informative article. There are lots of Windows 8 tablets available now in the market. It is very difficult to choose best gaming tablet among them. Popularity of Android gaming is increasing among tech savvy persons and I also recently brought the Archos gamepad Windows 8 OS tablet and its performance is really superb and amazing. It gives me a real experience of playing adventurous games.